If ever a rose in a collection was appropriately named it is Maurice Utrillo, from Delbards ‘Painters Collection’. 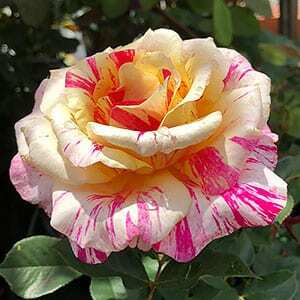 Yellow, white and pink to red all splashed in stripes over a voluptuous double flower. The flowers are large with a light fragrance and appear in small clusters on each stem. Foliage is a good deep green and this is another disease resistant variety. Maurice Utrillo is a reasonably compact grower, reaching around 1 metre in height. Grow it in the garden border, or try it in a container on a patio. We suggest using a general purpose rose food such as Sudden Impact for roses with an application every 8 weeks from early spring through summer. Regular seaweed fertiliser application will also help keep your Maurice Utrillo Rose Bush flowering freely.